You can find your API Token within your Account Settings. Simply click on the link or you can find your Account settings on the bottom left corner of the site. 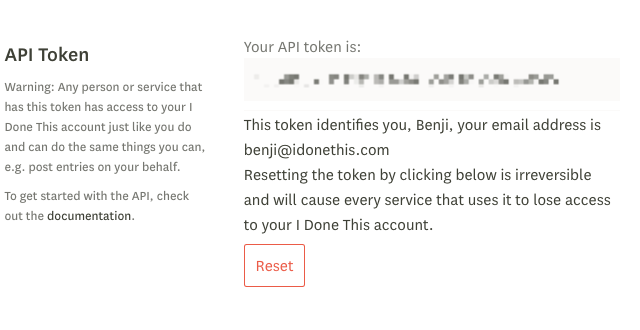 Once you are on the Account Settings page, scroll to the category, API Token. Upon the unfortunate event where your API Token has been leaked or stolen, you can also reset it here as well. Any person or service that has this token has access to your I Done This account just like you do and can do the same things you can, e.g. post entries on your behalf. To get started with the API, check out the documentation.